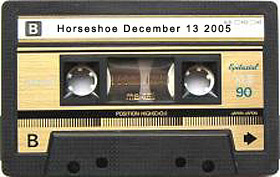 Details: The Rheostatics, live at the Legendary Horseshoe Tavern in Toronto, December 13, 2005. Ford Pier on keyboards. This was the 6th show of their 10 night Fall Nationals run at the Horseshoe. 8 track files provided by Steve Clarkson - mixed by Darrin Cappe with a bit of track specific compression, gain, limiting and slight reverb to drum and vocal tracks. After the encore break Ford Pier plays a solo version of Diaphanous Heart and then Dave fortuitously jokes that the band just decided to break up.